The Yankees are a league best 23-10 at home this season, and they will look to add to their win total when the Rays enter town for a four-game set. The Yankees are coming off a two-game split with the Washington Nationals, and are 7-3 over their last 10 games. The Rays just swept the Blue Jays at home but are a measly 4-6 over their last 10. The Rays offense has struggled all season, so look for the two young Yankee starters to go out and compete in the first two games of this series. This will be just the second series this season between the two clubs. Blake Snell has been far and away the Rays best pitcher and overall player this season. Snell has given up one run or less in eight of his fourteen starts this season. His is 10th in the league for pitcher WAR at 2.45. Snell had arguably his worst start of his season back on April 4th in the Bronx. He gave up five runs and was pulled after just 3.1 innings. The Yankees have caused Snell some problems over his short career. In nine starts versus the Bombers, Snell is 2-3 with a 4.58 ERA, averaging just above four innings per start. The southpaw may struggle with the big sluggers in the Yanks lineup. Domingo German will be making his 12th appearance and 7th start this season to open up this four-game set. His record and ERA accurately represent his struggles this season, but the staff is so thin that he continues to get ball every fifth day. German has a live arm and a nasty sinker that can touch 96mph, allowing him to average 10.3 K/9. German is coming off a quality start against the Mets in which he went six innings pitched, giving up three runs and striking out nine. Aaron Boone will hope he can get a similar start out of him on Thursday. The former Yankee Nathan Eovaldi will make his fourth start of the season in Game Two of this series after missing all of 2017 due to his second Tommy John surgery. Eovaldi thew up six hitless innings in his first start of the season but has allowed four and three runs respectively in his previous two outings. Eovaldi threw 102 pitches on Sunday, so it seems as if he no longer has a pitch limit. Eovaldi was always known for his strong fastball, but the velocity has dipped in his first three starts this season. This is a solid matchup for the strong Yankees lineup. Jonathan Loaisgia will be making his MLB debut Friday night after Mashiro Tanaka was sent to the 10-day DL with a double hamstring strain. He started the season at Class A Tampa but has made his last six starts at Class AA Trenton. Over his ten starts this season Loaisgia has been impressive. He is 6-1 with a 3.00 ERA and 1.13 WHIP. He also sports a 14/1 strikeout to walk ratio. His fastball can touch 98 and is complimented well with a big curveball. 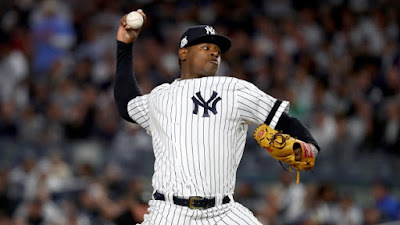 Boone and the Yankees will hope he proves himself as the Yankees pitching rotation looks to secure some loose ends. Rays Manager Kevin Cash announced in Spring Training that his ballclub would roll with a four-man rotation and have every fifth day be a “bullpen day.” If this is news to you, it basically means every fifth day the Rays send out a relief pitcher to start the game and pitch all nine innings with the pen. Sergio Romo has recently been thrust into the “relief pitcher that starts” role, but Ryan Yarbrough and Ryne Stanek have seen their fair share of starts as well. The reason Tampa Bay has back to back games with undecided pitchers is because two of the original four starters (Archer and Faria) have been sidelined with injuries. It is likely that one of these starts will be given to a current minor league player. Keep up with the BBB Twitter to find out when the starters are announced. The Yankees ace will take the ball during the afternoon on Saturday looking to continue his career dominance versus the Rays. Sevy has made seven career starts versus Tampa Bay and is 6-1 with a 2.77 ERA over these starts. He has an average of 11.9 K/9 and has only given up five home runs in over 48 innings of action against Tampa. On April fourth of this season Severino picked up a win against the Rays, going 7.1 IP and giving up just two runs. In his most recent start, Severino broke his 10 straight quality start streak, only going five innings versus the Mets. He will look to bounce back and continue his case as the best pitcher in the AL. CC Sabathia continues to impress in his 18th big league season. His ERA is his lowest since 2011, WHIP is his lowest since 2012, and H/9 is his lowest since 2010. His consistency has been key for a staff that has had its fair share of ups and downs through the first two and a half months of the season. Many of these Rays hitters have not faced Sabathia in their young careers, but RF CJ Cron is 3-for-7 off Sabathia with one big fly. Sabthia should have a solid plan of how he wants to attack the Rays lineup and should be effective in moving the ball around the corners. Sabathia is 6-0 in his last 12 home starts, not having dropped one in the Bronx since August 1st. Andujar has been impressive throughout the whole 2018 campaign, hitting .310 with eight long balls, 21 doubles, and 28 RBI. He has provided consistency at the hot corner for Aaron Boone. 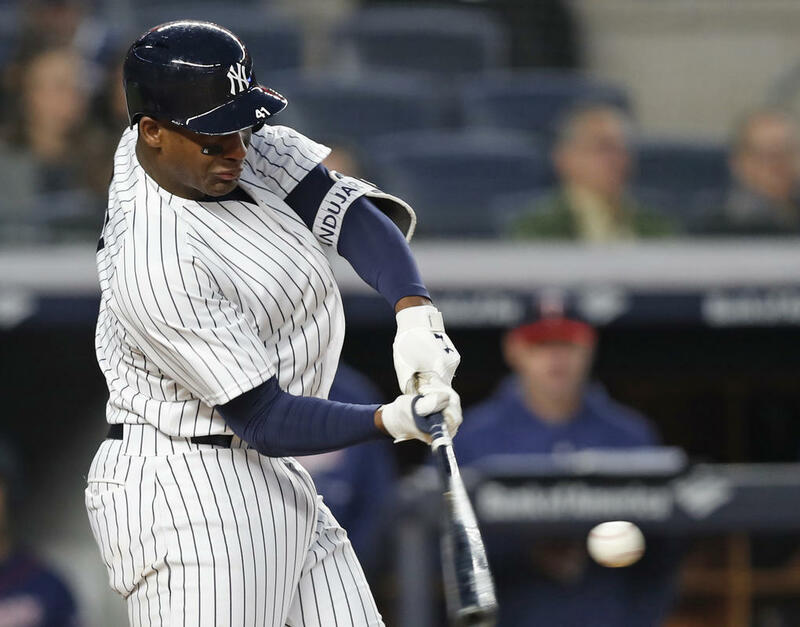 Over the last couple weeks, Andujar has been arguabley the Yankees hottest hitter. Over his last 15 games, Andujar is 20-for-52 (.385) with eight doubles, three home runs, 11 RBI, and 6 walks. He has increased his average by .22 over this stretch. Anudjar along with Torres provide depth to the bottom of the lineup making it a nightmare for opposing pitchers to face. Every Yankee fan is aware of how bad Sanchez has been at the plate this season. An 0-for-4 on Sunday dropped his averaged to .190, so Aaron Boone gave him Tuesday and Wednesday off. He is expected back in the lineup on Thursday, but only time will tell if the off days helped him out. This is a big series for Sanchez to get back on track. Sanchez has eaten up the Rays Thursday night starter, Blake Snell. He is a career 4-for-10 off of him with three big fly’s. Every Yankee fan will be rooting a little bit harder for #24 this weekend. This Rays lineup is pretty atrocious, but Matt Duffy has put together a good run at the dish in June. In 11 games in June, Duffy is 14-for-43 (.326) with five extra base hits. Duffy’s average on the season sits at .314, .25 points higher than the next closest Ray. He does not have much power but has been consistent out of the leadoff spot this season. Duffy has only faced the four Yankee starters a combined five times. It will be important for Yankee pitchers to keep him off the base paths. The Yankees took the only two matchups between these ball clubs in 2018 and will look to pick up at least three more at home this weekend versus Tampa Bay. The Rays sit only three games below .500 and are out performing a lot of early season projections. Their offense is in the bottom third of the league in runs, home runs, RBI, and extra-base hits, but they are 7th in batting average. This team struggles putting the ball over the fence which leads to inconsistency in run scoring. If the Yankees can put up six or more runs I think they will have a solid shot to win each game.